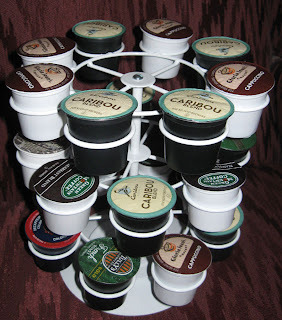 My second KCUP storage idea came in yesterday and I love it! I bought it from Avon and it is an Easter Egg holder. It won't be available until Campaign 6 which is the next book. If you have an Avon Lady, check with them, if not, let me know and I can instruct you how to have one shipped to you. I just changed the way the pieces went together to raise the bottom shelf and now I have a 3 tiered K Cup Holder that rotates for $9. 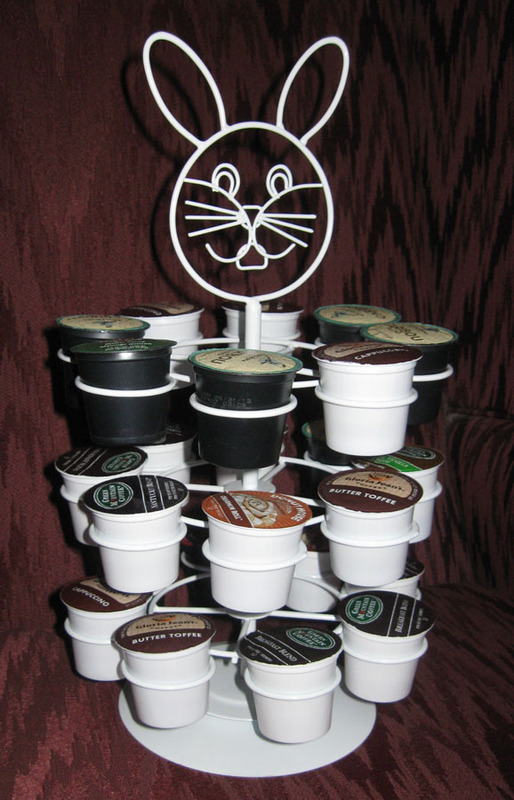 So, I'm assuming that any Easter egg holder should also fit KCups. This will work a lot better than those $25+ holders out there. Next step is to find some lamp finials to replace the Easter Bunny head. If I can't find them, then I'll be making some extra tops for the holder. UPDATE: After a couple tries, I was able to find an extra household bolt that temporarily fit in the top to temporarily replace the bunny head until around Easter. In the meantime, I'll keep an eye out for a lamp finial that may fit to add a decorative top for non holidays. I'll have to touch it up with a little white paint to blend in. I may create a quilted heart to cover the bunny head for Valentines Day.